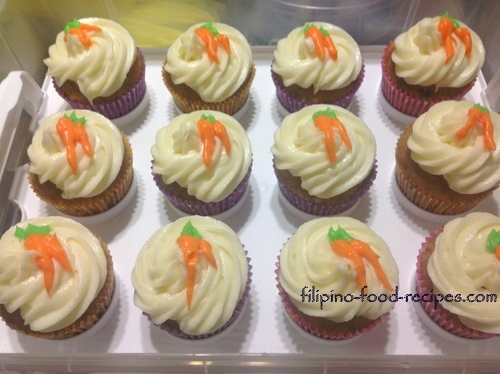 I love carrot cupcakes! This recipe uses a pound of carrots -- so it could be considered a vegetable dish somewhat? - or so I tell myself. I have tried a few recipes for carrot cakes and cupcakes and I like this one the best -- and hey, it's a 'tweaked' Martha Stewart recipe! It's straightforward, pretty much don't need a mixer, though using even a hand mixer would help make the cake more fluffy and the batter rise up nicely, and would make my life easier. The recipe is very moist because it is oil-based, or uses vegetable oil rather than butter -- so it stays soft even straight out of the refrigerator. (Butter cakes are usually hard out of the fridge, they have to come up to at least close to room temperature before you could enjoy them). As for the carrots, I use a food processor with a fine shredding disk, it does the job in just a minute, but if not available, a good old box grater (pang-gadgad) is just as good. 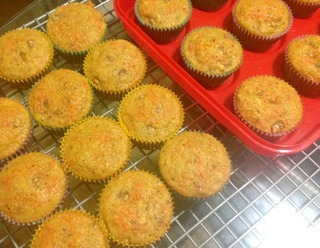 The best part of it all is the cream cheese icing -- I'd say it is just not right to use any other icing for carrot cupcakes -- this one is a tangy, not-too-sweet icing... And again, if a mixer is not available, beating by hand takes a little more time but it's doable. Preheat oven at 350ºF (around 180ºC). 1 Sift together the flour, sugar, baking powder, baking soda, salt. Set aside. 2 In a separate bowl, beat the eggs until light colored, then add the buttermilk, vegetable oil, vanilla extract and the spice mix of cinnamon powder, ground ginger and ground cloves. Stir in the raisins. 3 Whisk or mix together the dry and wet ingredients until fully incorporated. Fold in the nuts (optional). 4 Scoop on to individual paper-lined muffin tins and bake for 20 to 25 minutes or until a toothpick inserted in the middle comes out clean. 5 Set aside the cupcakes to cool down completely before frosting. 6 To make the Frosting , beat or whisk together softened butter, cream cheese and vanilla extract. 7 Add the confectioner's sugar a cup at a time, beating thoroughly. 8 Pipe onto completely cooled carrot cupcakes. 9 (Optional Step) To make the carrot decorations on top, prepare 2 bowls with 1/4 cup of the frosting each -- color one in orange, the other in green. 10 Using 2 small ziplock plastic bags, place the tinted frostings in each bag, and cut out a small hole at one corner for each. Pipe the orange carrot first for all the cupcakes, then do the green leaves next. (Press heavily at first for the thicker part of the carrot, then lightly as you go to the thinner end, then release -- same with the green leaves). 11 Your cupcake is ready to eat. Enjoy your vegetable dessert! - Buttermilk makes the cake more tender and the tangy flavor cuts into the sweetness of the cake -- but if not available, make your own buttermilk by stirring together 1/2 cup of milk with 2 1/4 tsp white vinegar and set it aside until it thickens or curdles -- about 15 to 20 minutes. Stir before using. - This cake has to be refrigerated until ready to serve. 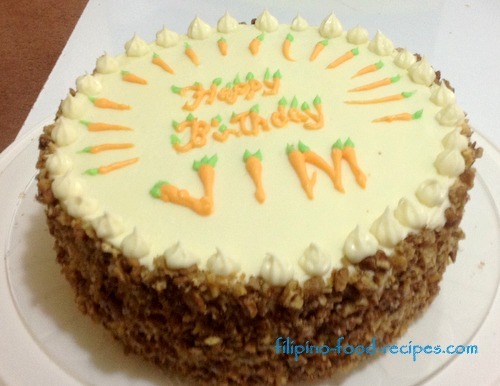 The frosting is not as stable as buttercream and the cream cheese could become runny and easily go bad if left out at room temperature for more than couple hours. - For those who are not crazy about putting frosting on cakes or cupcakes, just dust the top generously with confectioner's or icing sugar using a sieve. - The recipe can be made into a cake, as well - divide the batter equally in 2 8-inch or 9-inch round cake pans and bake at same temperature but for 30 to 35 minutes. Level the cakes and put 1 cup of frosting in between. Frost the cake top and side and apply (to cover the side) with toasted, coarsely chopped walnuts.